From the traditional lemon and butter or seafood seasoning blends, to exotic tropical or Asian-inspired spices, you can use a wide range of spices when baking flounder. 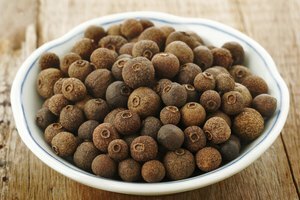 Ground spices, fresh-cut herbs you've grown yourself or familiar salad dressings all liven up the mild taste of the flounder, without adding much to the prep time in the kitchen or the baking time. Experiment to find just the right seasoning option for your family. Traditional ways of preparing a particular food dish become "traditional" for a reason -- they're usually either very simple, very tasty or both. Baked flounder falls into the third category, with the added plus that it's also a relatively low-fat, low-calorie dish when baked with a few simple seasonings. Sprinkle both sides of your flounder fillets with butter-flavored salt and black pepper or a lemon-pepper seasoning blend for a simple, yet elegant, main dish. Another option is to use a seasoning blend specifically for seafood, such as Old Bay seasoning. Tender flounder fillets, with their mild flavor, lend themselves to the use of strong or unusual spices. A little goes a long way, however, because you don't want the seasoning flavors to overpower the fish. Rub the fillets with your favorite Cajun spice blend for a hot-and-spicy fish dinner. Enjoy the exotic tastes of Morocco by using a blend of cumin, coriander, cinnamon and pepper to coat the fish before baking. Add an Asian flair to your baked flounder by using Chinese five-spice powder. 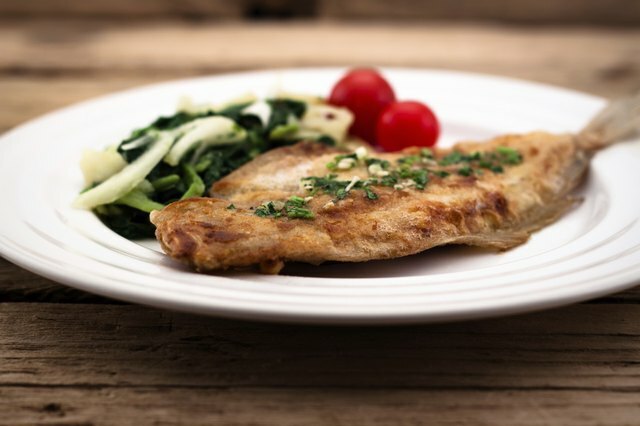 Fennel seed, basil and oregano will make your flounder a perfect entree for an Italian meal. 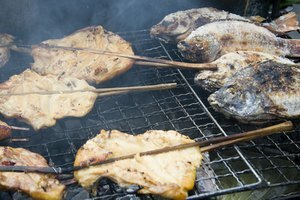 Fish is a staple food in many island and tropical countries. Bring the flavor of the tropics home by using spices such as ginger, garlic, coriander, salt and pepper. Rub the fillets on both sides with the seasonings, then bake until the fish is flaky and tender. You can also marinate the fish before baking, using lemon or lime juice. Before baking, remove the fish from the marinade and season the fillets with cumin, cayenne and cilantro. For a more delicate island flavor, season with salt, red and black pepper, and a little cinnamon. 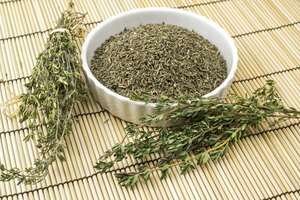 Fresh herbs give you another whole range of seasoning options. You can create your own seasoning blends with either fresh or dried herbs, many of which are perfect accompaniments to flounder or other tender white fish. Chop or crush parsley and thyme, then blend in a little salt, black pepper, garlic powder and onion powder. 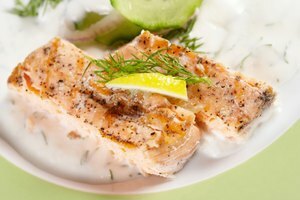 Brush both sides of the fish with prepared mustard, plain yogurt or ranch dressing. Press the herb blend into the fish to cover it on both sides, then bake until done. For a quick alternative, dip the fillets in your favorite Italian dressing, then in seasoned breadcrumbs, and bake as usual.